Duncan Hines® helps you create delicious family moments with decadent recipes even the tiniest pair of hands in your family can help make. Baking at home with family creates unforgettable moments and fills the holidays with that priceless feeling of togetherness. Created by the authors of the popular cupcake decorating book Hello Cupcake!™. This is a fun Easter project to make with the kids or with your baking friends. All it takes are easy-to-find ingredients, fun food dye colors and delicious frosting. 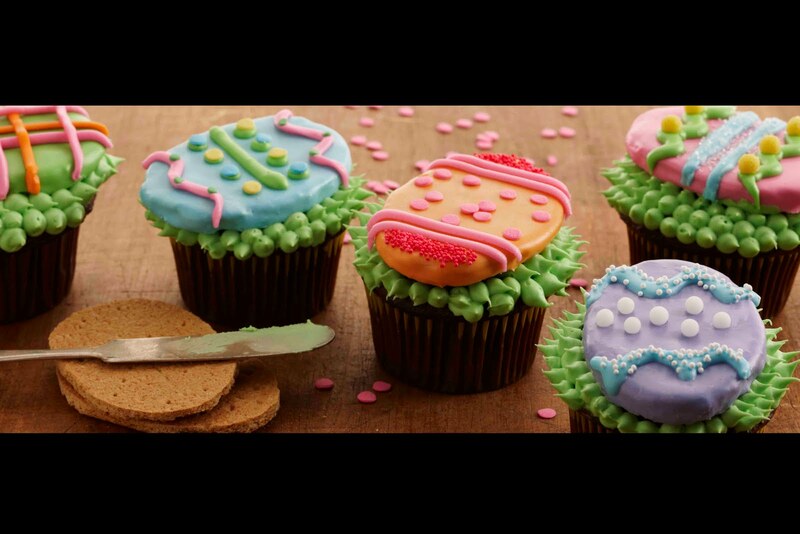 Easter Egg Cupcakes aren't hard to make -- but they’re sure to impress as gifts, or to decorate your holiday table. 1. Tint 2 cups of the frosting light green. Spoon 1 1/2 cups of the light green frosting into a zippered plastic bag. Tint 1/2 cup each of vanilla frosting pink, light blue, light purple, orange, and yellow. Spoon 2 tablespoons each into zippered plastic bags. Press out the excess air in each of the bags, seal, and set aside. 2. Using a serrated knife, trim the graham crackers into an egg shape 3 1/2 inches long and 2 1/2 inches wide. Snip a small corner (1/4 inch) from the bag with the 1 1/2 cups of green frosting and pipe a small dollop on top of each cupcake and place a graham cracker on top, pressing down to secure. The cracker will hang over the edge of the cupcake. Freeze the cupcakes for 10 to 15 minutes to set. 3. Place the remaining 1/2 cup of each tinted frosting into a separate microwavable bowl. Working with one color at a time, microwave the frosting, stirring frequently, until it is the texture of lightly whipped cream, 20 to 30 seconds. Holding a chilled cupcake by the paper liner dip the graham cracker into the melted frosting to coat, turn right side up and let stand. Continue with all of the cupcakes and graham crackers making two eggs of each color. 4. Snip very small corners (1/8 inch) from the bags with the 2 tablespoons of frosting. Pipe decorative dots, lines, and dashes on top of the frosting-coated crackers. Using the bag with the 1 1/2 cups of light green frosting, pipe dots of frosting around base of each egg always pulling the peak away from the egg (be sure to cover any exposed cupcake). 5. While the frosting is still wet add candy decors to create decorative patterns. For more recipes, visit Duncan Hines. Your cupcakes are so cute!! Anonymous: The directions suggest using a serrated knife to cut them.